Check out the latest Army STAND-TO message regarding CSEPP. 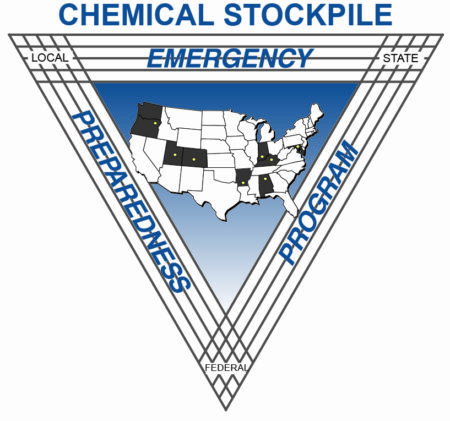 The Chemical Stockpile Emergency Preparedness Program (CSEPP) works closely with communities around the Nation’s remaining chemical weapons stockpiles. Since the program began in 1988, state and local emergency management officials have teamed with the Army and the Federal Emergency Management Agency (FEMA) to improve their ability to protect you. This partnership has helped these communities by enhancing emergency plans and providing chemical accident response equipment and warning systems for emergencies. Depending on the location of the community, such emergencies may include tornados, hurricanes, earthquakes, floods, fires, hazardous material spills or releases and transportation and industrial accidents. Chemical stockpile emergency preparedness exercises are held in communities surrounding the two remaining chemical weapons stockpiles at Blue Grass Chemical Depot, Kentucky, and Pueblo Chemical Depot, Colorado, each year. The communities and states join the Army and FEMA to practice keeping the public safe in the unlikely event of a chemical stockpile accident. CSEPP training gives emergency responders – such as police officers, firefighters and emergency medical teams – skills and knowledge they can use every day. 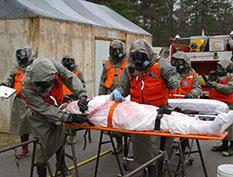 Why is this emergency preparedness effort needed? Earlier studies of emergency preparedness capabilities of the communities near the stockpiles indicated inadequacies or shortfalls, to varying degrees, and the need for enhancement of existing emergency plans, training, equipment and/or facilities. 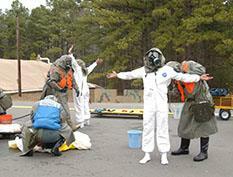 Who’s involved in this emergency preparedness program? Local and state emergency services, as well as public health, environmental, fire and rescue, law enforcement and medical services agencies have major roles, along with elected and appointed officials. The Army, as custodian of the stockpiles, and FEMA, which has long-standing experience in preparing for and dealing with all kinds of emergencies, provide funding, training, guidance and technical support and expertise. Other federal agencies, such as the U.S. Environmental Protection Agency and the U.S. Department of Health and Human Services, also lend their expertise in specific areas of the program. The program combines the efforts of local, state and federal agencies and jurisdictions. Community and public participation in and knowledge of the program are essential to its success. What has this program accomplished? Communities and states have reaped the benefits in improved emergency facilities, equipment, training and planning. Many of these enhancements increase their capabilities to deal with more likely emergencies such as transportation accidents involving hazardous materials, floods and fires, in addition to a chemical stockpile emergency. Program enhancements include new command and public/media information facilities, communications equipment, sirens and tone-alert radios to warn and instruct the public, computerized planning and accident assessment tools, automated on-post and off-post communication systems and improved emergency personnel training. Interested in learning more about keeping your family safe in an emergency?